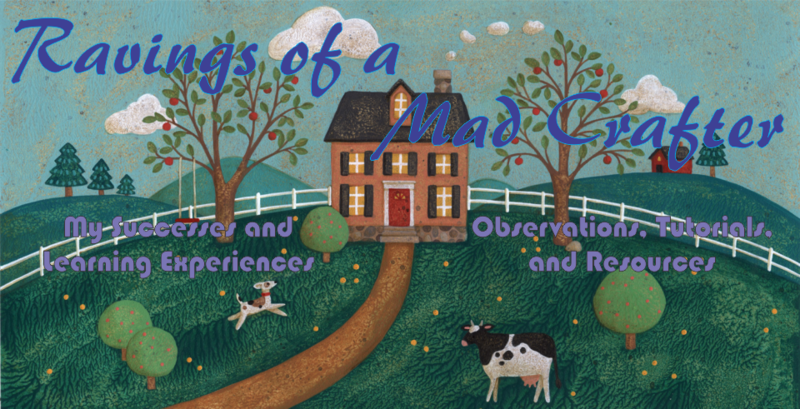 Ravings of a Mad Crafter: Brown Roses? Last night around 9:00 I had an overwhelming desire to dye some ribbon. The choices were cocoa brown, cocoa brown, fuchsia or black. Since I had two browns it won. I can't even remember what I bought the brown dye for but I suspect it was to dye some muslin. So I used 2 cups of hot water 1/2 cup salt, a dye package, 2 yards of 1 1/2 inch ribbon and 3 yards of 1 inch ribbon. Then let the mess sit for 12 hours. 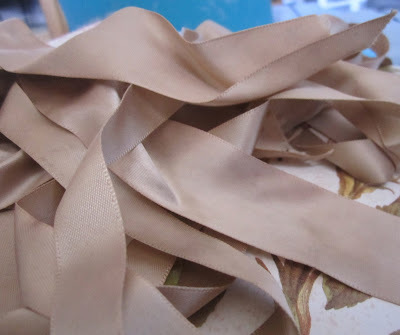 After rinsing the ribbon out it looks like a ribbon that has seen to much sunlight and is a faded brown. 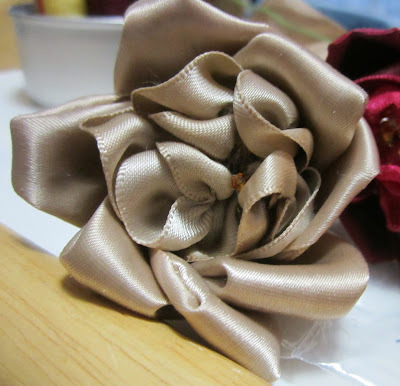 The brown ribbon may not be pretty enough on it's own but it might be nice for a random petal here and there. Finished three row brown ribbon rose. 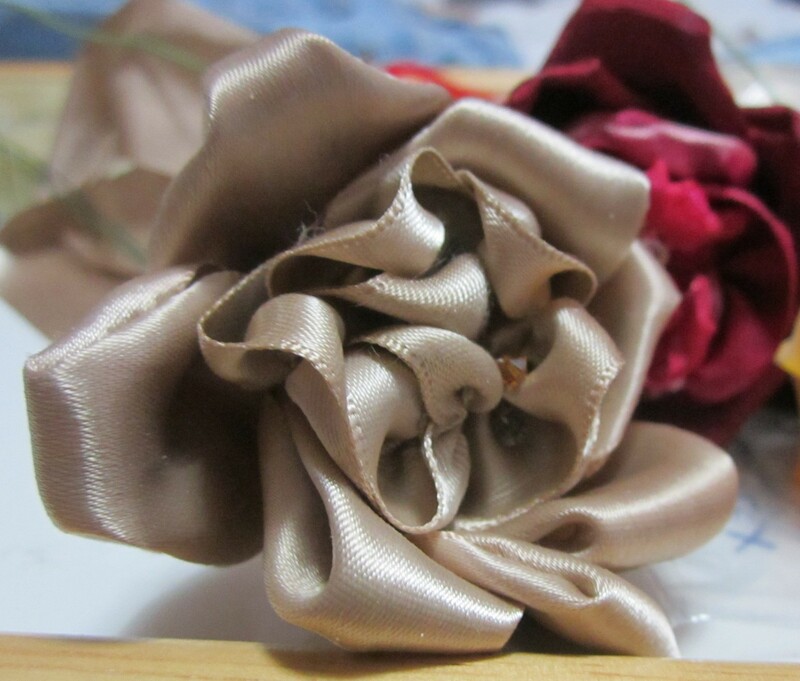 Another view of brown ribbon rose. Last evening I also went through and calculated how much ribbon it took to do a 3 row rose and then 4 row rose. The 3 row rose takes 8.5 inches of 1 inch ribbon for row 1. Row 2 takes 12 inches of 1 inch ribbon. Row 3 takes at most 21 inches of 1 1/2 inch ribbon. That makes up to 6 petals on row 3. Row 4 takes between 20 inches and 28 inches of 1 1/2 inch ribbon. So that last row really is eating up the ribbon. The 4th row is eating about 2 feet of ribbon alone. So I may only make 3 rows flowers. Small but I think they look better. Today I also went to Beverly's to meet up with friends. We talked about the Altrusa tree and what the decorations will be like. A lot of soft pink with a Victorian feel to it. So I am determined to make several ornaments. Tonight I am looking for some ideas and even patterns for a swan ornament. Hopefully I find one and don't have to draw my own! When I came home I made a brown 3 row rose, with luck tomorrow will be more productive.